January 21, 2018 4:42 pm. 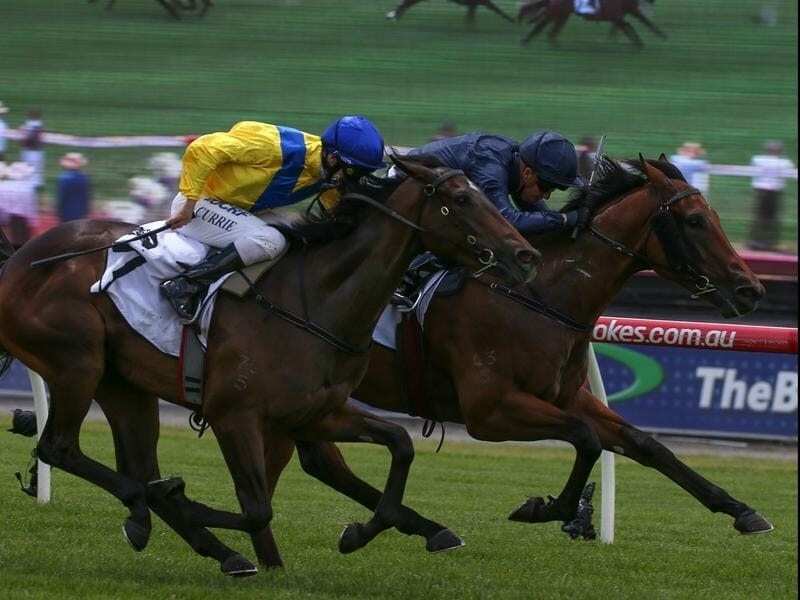 Long Leaf (right) will begin his Blue Diamond Stakes campaign in the Preview at Caulfield. Lindsay Park’s assault on this year’s Blue Diamond series will begin in the Previews at Caulfield. The stable had six runners in last year’s Group One Blue Diamond for juveniles, with five finishing in the first seven headlined by brilliant winner Catchy. Lindsay Park trainers David and Ben Hayes and Tom Dabernig also have a number of youngsters in Blue Diamond contention this year including stakes-winning colt Long Leaf who resumes in Saturday’s colts and geldings Preview (1000m). Ennis Hill will be the stable’s representative in Saturday’s fillies Preview (1000m). Long Leaf chased down La Pomme De Pin to win on debut in Adelaide before taking out the Listed Merson Cooper Stakes at Sandown in November. The stable considered the sales-restricted Karaka Million in New Zealand but decided to keep Long Leaf at home. “We just thought, being a Fastnet Rock colt, the Blue Diamond is on our doorstep and the Karaka Million doesn’t have the black-type associated to it,” Dabernig said. “We thought we’d keep him in our backyard and head that way. He seems to be going really well and looks a classy sort of colt. Damien Oliver will ride Long Leaf in the Preview. Ennis Hill, to be ridden by Mark Zahra, ran fourth on debut last month at Caulfield in a race Dabernig said the stable had fancied her chances in. “She’ll probably go into a set of blinkers and she looks to have good talent,” Dabernig said. Dabernig indicated Nasaayim and Angel were also scheduled to run in the fillies Prelude. The stable is thinking about going into the Blue Diamond first-up with Debutant Stakes winner Qafila, who finished fourth in the Ottowa Stakes at her second start. “We’re just worried that if we run her before the Blue Diamond she might then be looking for a bit more ground, so it’s a bit of an experiment but we’ll see how we go,” Dabernig said.